If you hear the word “polo” and have an image of snooty ladies in couture apparel and wide-brimmed hats alongside ultra-rich trust fund gents with pricey sports cars, you’ll be pleasantly surprised to learn the South Valley has its own polo club — one that’s shattering stereotypes about the Sport of Kings faster than you can saddle up and play a chukker. Located at 1290 Masten Ave. in northeast Gilroy, the South Bay Polo Club is a welcoming experience that feels more like a friendly group outing than a high-society event. And that’s just fine with its members, and those who come out to the bucolic setting to watch and learn. “We’re a very social club. 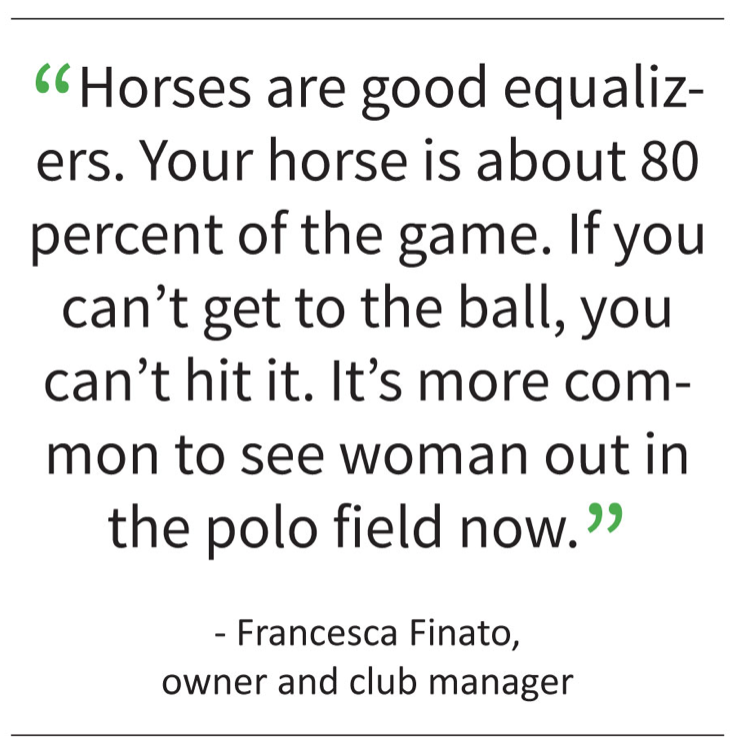 We say come for the polo and stay for the party,” said owner and club manager Francesca Finato. True to form, after weekend matches, the polo players usually have a barbecue in the shaded picnic area near the field. On weeknights, they go out for drinks or dinner. Veteran players with a passion for the sport are always encouraging new players. They coach a bit, pass on the traditions — as it was surely passed on to them when they first started — and discuss technique and equipment. The polo club began in 2012 at a full-service horse boarding ranch. It offers a full-sized polo field, as well as a covered arena that lets them play year-round. In addition to polo, they offer boarding, horse care, lessons, and clinics. Two club pros, Juan Jose Gonzalez and Santos Arriola, help coach while playing games and keep the game flowing well. One of the founding members, Tim Westin, put things together and then moved to Southern California. Finato played for three years on the women’s intercollegiate polo team while she attended Cal Poly in San Luis Obispo. 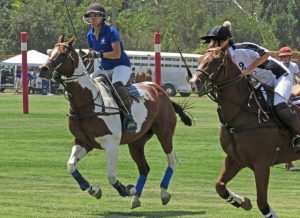 She had been working as the South Bay Polo ranch manager when she decided to focus solely on the polo club. Two riders race for the ball during a recent polo match. have to maintain.” She also looked to Erik Wright, of Wrightway Polo, as a mentor and influence. She sees plenty of venture capitalists, doctors, lawyers, and tech professionals in her clientele. Dale Johnson, who lives in San Francisco and works as a senior data analyst for a Dutch payments firm, just started playing polo in May. He previously trained in Olympic lifting and takes English riding lessons in Pacifica. But he makes the trek to Gilroy to “stick and ball” with South Bay Polo Club. “With polo, you work on balance and strength at the same time,” Johnson said. He kindly explained the nature of the game and exchanged advice with fellow players. A true data analyst, Johnson tracks his progress on a spreadsheet. “When you know your weaknesses, you can be deliberate in practice,” he said. When Finato recommended adjustments he could make to his canter, Johnson eagerly listened, appreciative of the instruction. 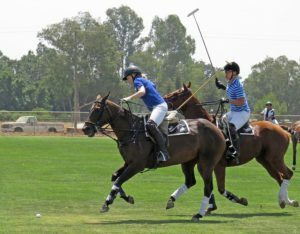 Despite the sport’s reputation, many people are surprised that it doesn’t take an exorbitant amount of money to play polo these days. You can play a full game and have two horses with a little expendable income. For example, for $200 per session, South Bay Polo Club offers Introduction to Polo clinics every Wednesday night at the Horse Park in Woodside. The clinics run through September. The $200 fee covers a horse and everything you need, and you can play the first day. It’s a fun way to get introduced to the sport. Or, you can come to South Bay Polo Club and get private instruction for $125 per lesson. These also include everything needed. Each rider is different. Some will be ready to play after a couple of lessons. Some take longer. South Bay Polo Club has a full lease string of 10 horses. If you have your own horse, they can board it for you. Finato calls it a “turnkey operation.” Just show up and get on it. “We keep them fit, keep them sound, keep them happy, and keep them healthy,” Finato said. 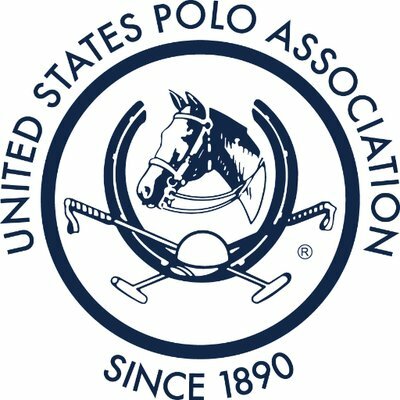 Another surprise is that women are the fastest growing demographic in polo. Sixty-one-year-old Ann Terranova is a perfect example. A financial planner with an office in San Francisco, Terranova hadn’t even thrown a leg over a horse until the age of 52. Her son says that polo is his mom’s answer to the empty nest. Terranova never looked back. She started playing polo a few years ago and created the life she always wanted to live. She’s seen benefits on and off the field. Terranova plans to move to Gilroy and buy a ranch so she can be close to the four horses she owns. But aside from the polo field, there’s also a deep emotional connection.